Biologists estimate there are between 20,000 and 25,000 polar bears, 60% of those live in Canada. Polar bears are also found in the U.S. (Alaska), Russia, Greenland and Norway. In 2008, the U.S. listed the polar bear as a threatened species under the Endangered Species Act, citing sea ice losses in the Arctic from climate change as the single biggest threat to these magnificent bears. Polar bears depend on sea ice for hunting, breeding, and in some cases, denning. In 2012, summer sea ice losses in the Arctic were larger than the size of the United States. On International Polar Bear Day, or starting any day you choose, adjust your thermostat a few degrees (up or down, depending on where you live or the season) to show your commitment to greenhouse gas reductions. Pledge to make every day a Polar Bear Day by keeping your thermostat adjusted, insulating your home, or taking other steps to save energy. Speak up in favor of a sustainable future for your children and grandchildren by letting your representatives know you support a fair price for carbon. Saving energy produced by carbon-based fuels reduces our carbon emissions and can slow down and even reverse climate change, which causes the sea ice to melt. Without sea ice, the polar bears can’t survive. Scientists predict that unless we take action to stop climate change, we will lose two-thirds of all polar bears by the middle of the century, and all of them by the end of the century. To recognize International Polar Bear Day, visitors are invited to see the Zoo’s resident polar bear, Snow Lilly, interact with special enrichment on Thursday, February 27 at 10:30 a.m. and 2:00 p.m. Enrichment allows animals to exercise their minds, and display different behaviors that they would in their wild habitats. 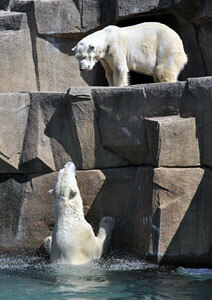 For more information on the plight of polar bears, visit Polar Bears International.